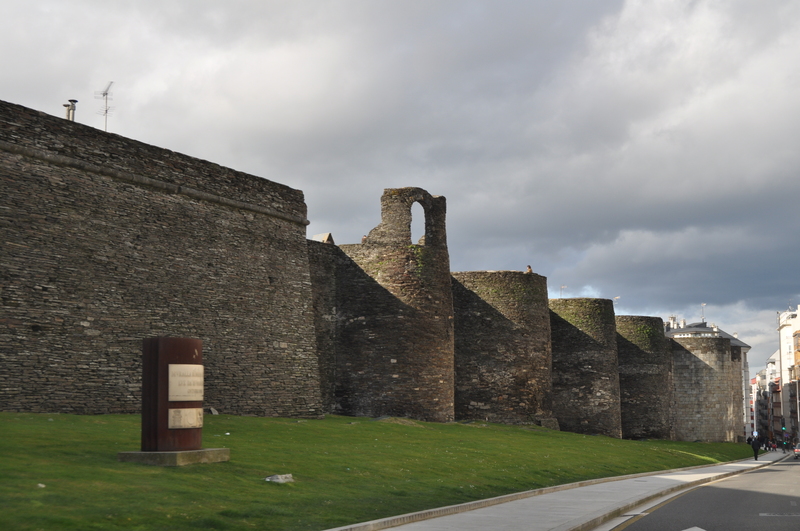 When we speak of Lugo it is inevitable to think immediately of its Roman wall, but… do you know everything about it? It was Paulo Fabio Maximo who, in the 13th year BC, founded the city of Lugo, formerly called “Lucus Augusti” (in honour of Emperor Cesar Augustus). It was therefore necessary to build a wall to defend the city from enemy attacks, also building, along its route, almost a hundred towers (today almost seventy are preserved). However, it is not until the 3rd century AD. that ends with the construction of what is nowadays one of the most important monuments in the world. Although in its beginnings five doors were open in the wall, along the years they opened more (until arriving to ten), while houses were constructed in the holes of the towers. The wooden doors at each entrance remained in place for centuries, and disappeared definitively in 1877, leaving free access to the interior walls. In its origins, the wall also had a moat about 20 meters wide and an intervallum, which was a kind of interior walk between the wall itself and the buildings that had been built inside. These two elements were a complement to the time of defending the city. But besides being an element of defence, the wall also delimited the charter and, therefore, the taxes to collect. Inside, the oldest urban settlement of our community and main axis of the three juridical convents that conformed Gallaecia in the time of the Roman Empire. In the eighth century it suffered the Muslim occupation, being reconquered again by Alfonso I years later. Its great development took place, however, in the twelfth century, when it became a place of passage for the pilgrims on the Camino de Santiago, maintaining its grandeur until the year 1528, in which King Carlos I decided to name the capital city of the Kingdom of Galicia. Curiously, it is from here that begins a decline that lasted until the eighteenth century, when it begins to grow again and endowed with economic, cultural and institutional improvements that over time made it modernized and reached again its historical importance as an urban centre. Nowadays, the wall is extraordinary conserved being, besides, the unique Roman wall of the world that remains whole. This is why it is quite common to find people walking over on a walk of just over two kilometres in which, in addition to enjoying exceptional views, one ends up leaving aside the time to feel that it is part of the Imperial Rome. What makes this wall special is, therefore, the fact of resisting today intact. Perhaps for this reason it was declared National Monument in 1921 and, in the year 2000, it received the title of World Heritage Site. In addition, in 2007 he twinned with the Great Wall of China of Qinhuangdao. We are, finally, on a place whose great cultural and historical wealth makes the visit worthwhile from beginning to end.